If you have ever been on Russell Street between MLK and Williams after dark you have probably noticed the orange neon sign near the corner of Russell and Rodney. 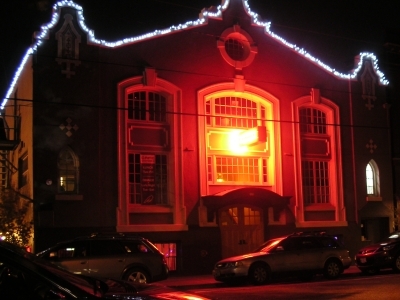 Just about every night it lights up for the Wonder Ballroom and Cafe Wonder. The final phase of The ReBuilding Center of Our United Villages expansion project is complete. This green office remodel is a source of inspiration for anyone considering sustainable alternatives to construction and/or remodeling. See it at the Tenth Year Anniversary and Open House. After some construction delays Knott Street Dermatology opened their new main office in the historic building at 301 NE Knott in late August. Planting a tree in your yard or parking strip has never been easier. Friends of Trees now offers an online form for ordering trees to plant during the Eliot Neighborhood planting on Saturday February 16th. Simply click on “Order Street Trees” at www.friendsoftrees.org and follow the directions. To allow time for the permitting process prior to your purchase, you must initiate your order by December 3rd.